Posted July 19th, 2012 by Yvonne Hawkey & filed under Digital, Moon. The 100â€™s bigger brother certainly packs a bigger punch. The larger chassis makes room for a better power supply which brings much more with it to the party. Weâ€™ve also got 4 digital inputs and some balanced XLR outputs â€“ very professional. 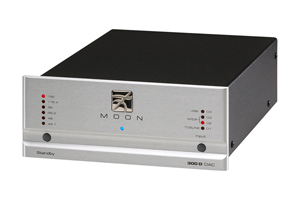 Use the 300 with a good quality digital source and youâ€™ll be presented with a superbly detailed musical performance.